Osteoarthritis is a condition that can cause gradual damage to your joints, making them stiff and painful. Your knees, hips and the small joints in your hands are the most commonly affected. If you have osteoarthritis, there’s lots you can do to ease your symptoms, as well as devices and treatments that can help. Arthritis is a general term meaning inflamed, stiff and painful joints. 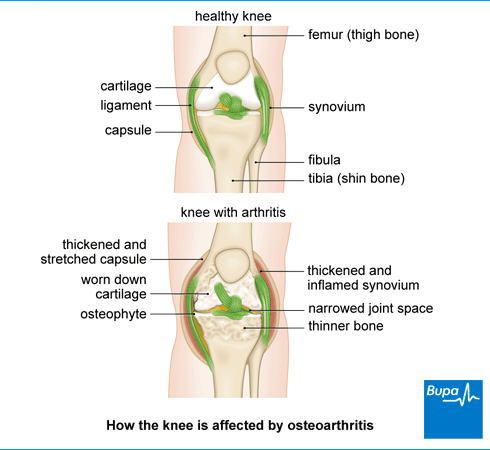 Osteoarthritis is the most common form of arthritis, affecting around a third of people aged 45 and over in the UK (around 8.75 million people). You’re more likely to develop osteoarthritis the older you get. Osteoarthritis is thought to develop as a result of damage to your joints. As your joint tries to repair itself, it can lead to changes in the structure of the tissues inside your joint. The cartilage that covers the ends of your bone may become damaged and thinner. You can develop bony growths, and the membranes that line the joint can become inflamed. These changes can lead to pain and stiffness in your joint. Osteoarthritis can affect people in different ways, and can affect one joint differently to another. Osteoarthritis can sometimes get worse over time, but this isn’t always the case. The main symptoms of osteoarthritis are pain, stiffness and loss of function in the affected joint. Sometimes the pain can spread, or you may feel it in a different area of your body than the joint that’s affected. For instance, if you have osteoarthritis in your hip you might feel pain in your thigh, knee or ankle. You’ll usually only feel pain when you use your joint, but if your arthritis is severe, you may be in pain when you’re resting too. Your joint may feel stiff first thing in the morning, or after resting, but this usually wears off quickly. You may notice other symptoms developing over time. The main ones are listed below. Not being able to move your joint into the positions or as far as you did before, or being painful to do so. A crunching and grinding feeling and noise in your joints when you move them. Change in the shape of your joint, with hard bony growths and/or soft swelling caused by extra fluid. Your joint may give way when you put weight on it. This can happen because your muscles have weakened or because of the changes in your joint. There may be times when your symptoms get worse. For example, many people with osteoarthritis find that their symptoms are worse just before it rains. Often you won’t know what the reason is – you’ll just have some times when things are easier than others. These symptoms can sometimes be due to other problems. If you have any of these symptoms, see your GP for advice. Your GP will ask about your symptoms including where and when you feel any pain, how bad it is and how long it’s been going on. They may also ask you about anything that may increase your risk of osteoarthritis. This includes your medical and family history, what work you do (or used to do), and whether you’ve had any past injuries from sport or work. Your GP will also want to know how much of an impact your symptoms are having on your day-to-day life. There’s no single test for osteoarthritis and an examination by your GP is usually all that’s needed to diagnose the condition. Your GP may look to see if you have any bony growths and swelling and any creaking in your joint. They’ll look for any shrinking (‘wasting’) of the muscles around your joint. They might also check how well your joint moves and how stable it is. Sometimes your GP may suggest you have an X-ray if this can help to confirm a diagnosis, or rule out other conditions, but it isn’t usually necessary. Your GP will talk to you about several things you can do to reduce the pain and stiffness in your joints, and make day-to-day life easier. Some of the main ones are listed below. Make sure you exercise regularly. No matter how bad your osteoarthritis is, or how much pain you’re in, keeping moving is one of the most beneficial things you can do. Exercise can help to keep your joints working well and reduce your pain. It will also help to build up your muscle strength. See our FAQ below on what type of exercises to do for more information. If you’re overweight or obese, aim to lose the excess weight. Excess weight can put more stress on your joints and make osteoarthritis worse, so losing it can help. Use our BMI calculator to see if you’re a healthy weight. If you have osteoarthritis in your knee, make sure you wear shoes with a soft, thick, cushioned sole or use an insole. This will help to reduce any jarring. Try using a heat pad or an ice pack to help relieve pain. Don’t put either of these directly on to your skin as they may damage it or even give you a burn. Wrap them in a towel or dishcloth first. There’s no cure for osteoarthritis, but there are a number of treatments that can help you to manage it and control your symptoms. Your GP will discuss with you the various options for managing your arthritis. What they recommend will depend on your personal circumstances. These may include how severe your symptoms are, which joints are affected, whether you work and your leisure activities. Your GP may refer you to other health professionals, who can give you more practical advice and recommend various aids and devices that can help. This may include physiotherapists, occupational therapists and podiatrists. A physiotherapist is a health professional who specialises in maintaining and improving movement and mobility. They can assess whether braces, splints and supports would be useful for you. These can help to protect your joint. You use them in addition to other treatments to reduce pain and help keep your joint stable. Your physiotherapist can also advise you on using TENS machines for pain relief. TENS stands for Transcutaneous Electrical Nerve Stimulation. It’s an electronic device that sends pulses through your skin to stop or reduce pain signals coming from your nerve endings. Some people with osteoarthritis find it useful, although it doesn’t work for everyone. You can buy TENS machines from a pharmacy or on the internet without a prescription, but a physiotherapist can advise you on the best way to use it. They can also often lend you a TENS machine to try first, before you buy one. An occupational therapist can advise you on changes you can make to your car, home or workplace to ease any stress on your joints. These may include fitting bath aids, chair and bed raisers, grab rails and additional stair rails. They may also recommend devices that can help – like walking sticks or aids. Or if it’s your hand that’s affected, tap turners or pen grips to help with writing. A podiatrist specialises in conditions that affect the feet. They can give you advice on the best footwear to use, and whether insoles would help. Medicines won’t cure your osteoarthritis, but they may help to ease your pain and stiffness. Your doctor may suggest trying some of the following. Creams or gels containing a non-steroidal anti-inflammatory (NSAID) medicine, or a painkilling substance called capsaicin. You can rub these directly on to your joint. Paracetamol. You’ll usually need to take paracetamol regularly, rather than just when you're in pain to get the most benefit. NSAID tablets (eg ibuprofen or naproxen), or a similar type of medicine called a COX-2 inhibitor (eg celecoxib). Your GP may suggest these if creams/gels and paracetamol haven’t helped. These medicines can cause side-effects to your digestive system. Your doctor will usually prescribe another medicine called a proton-pump inhibitor to take alongside them, to help reduce these side-effects. Opioids. Occasionally, if you have severe symptoms and other medicines aren't helping, your GP may suggest a stronger type of painkiller called an opioid. Always read the patient information leaflet that comes with your medicine and if you have any questions ask your pharmacist for advice. If you have a flare-up of severe pain, despite your regular painkillers, your GP may suggest you have a steroid injection into your joint. Your GP may be able to do this themselves, or they may refer you to a physiotherapist or a musculoskeletal clinic to have it. Another treatment you may be able to try is injections with a substance called hyaluronic acid. Hyaluronic acid is normally found in your joints and helps to lubricate them (keep them moving smoothly). Not everyone who tries these injections finds them helpful, but they may offer you some temporary pain relief and they have very few side-effects. These injections aren’t recommended by NICE (an organisation that provides clinical guidance and advice to the NHS), as there isn’t enough evidence that they work. In some areas, you may still be able to get them on the NHS. In others, you may need a referral to a private clinic. If your pain is severe or has a significant impact on your life, and other treatments aren’t helping, you may be referred to an orthopaedic surgeon. The surgeon will meet with you to discuss whether surgery on your joint may be an option for you. Surgery may involve replacing all or part of your joint with an artificial one. Another type of surgery involves joining (‘fusing’) bones in your joint together. Your doctor will discuss with you what’s best in your particular circumstances. Complementary therapies tend to be traditional therapies that can be used alongside conventional medicine (treatments offered by doctors as part of standard medical care). There are a variety of things that people have tried for osteoarthritis. These include glucosamine and chondroitin supplements, creams and gels containing substances that irritate your skin (rubefacients) and acupuncture. Glucosamine and chondroitin are two of the most commonly used supplements for osteoarthritis. Experts aren’t yet sure how well they work, if at all. However, from studies so far it seems that chondroitin, with or without glucosamine, might help a little to reduce pain. Glucosamine and chondroitin aren’t generally recommended by doctors as treatments for osteoarthritis. Although many people use them, there’s no good evidence that any of these therapies work, so it’s not something your GP will be able to offer you. You can still choose to try them if you wish, but bear in mind they might not help, and be aware of possible side-effects and risks. If you’re planning to try a supplement or herbal medicine, it’s worth speaking to your pharmacist first, as they might interact with other medicines you’re taking. You can find out more information about specific complementary therapies for osteoarthritis from the charity Versus Arthritis – see our Other helpful websites section below for details. Having joint pain and reduced movement can make it harder for you to get out and about, care for yourself, go to work or enjoy your hobbies and interests. These problems can get you down, and affect your self-confidence too. But there’s a lot you can do to help yourself. Having osteoarthritis doesn’t necessarily mean that you’ll have to give up the things you enjoy – just that you might need to make some adaptations. Keep as active as possible – this is really important as it can help to reduce your symptoms, as well as make you feel better too. Try to keep up any hobbies and interests you enjoy, or think about taking up a new one. And try to stay connected with friends and family – it can be easy to feel isolated if you have arthritis. There are also local support groups for people with arthritis, that you may find helpful. If you’re in work, ask if your employer has an occupational health department. They’ll be able to help you make adjustments to your way of working, or to your working environment to help you. See our resources section for details of organisations which can provide information, support and lots of practical tips on living with osteoarthritis. Does diet have any effect on osteoarthritis? Does diet have any effect on osteoarthritis? You can’t cure your arthritis through your diet. But some people do seem to find that their symptoms improve when they change what they eat. There’s a wide range of foods and supplements that people have suggested may be able to help with osteoarthritis, including glucosamine and chondroitin supplements. However, there’s very little evidence to support any of these. It’s wise though, to make sure you have a wide, varied diet, which can give you all the vitamins, minerals, and other nutrients you need. This will help to keep you in the best possible health. Some people feel that certain fruits and vegetables make their arthritis worse. These tend to include vegetables from the ‘nightshade’ family, including potatoes, tomatoes, peppers, chillies and aubergines, and citrus fruits like oranges and lemons. Again, there’s no scientific evidence that cutting these out of your diet can help though, so it’s not recommended that you do. These fruits and vegetables contain important nutrients that form an important part of a healthy diet. The most important link between diet and arthritis is the effect it has on your weight. If you’re overweight, this will put a strain on your joints, particularly your knees, hips and lower back. This will affect how mobile you are. It’s not just through the strain on your joints that weight is linked to osteoarthritis. Scientists think that chemicals released by fat cells in your body may cause inflammation around your joints. Aim to eat a healthy, balanced diet that can maintain a healthy weight. And if you’re overweight or obese, if you lose even just a little weight, it may significantly help to reduce pain and stiffness in your joints. Use our BMI (body mass index) calculator to see if you’re a healthy weight. What can I do at home to make life easier? What can I do at home to make life easier? There are many things you can do at home to make day-to-day tasks easier for you and reduce the stress on your joints. If you make a few small changes, it may help to protect your joints and ease aches and pains. Some helpful tips are listed below. Use labour-saving gadgets and aids specially designed for people with arthritis. These include devices for turning on taps, kitchen utensils with padded handles, sticks to help reach or pick up items, and automatic can-openers. Rearrange your kitchen and other rooms to make sure the things you use most are easy to reach. Think about making some adaptations in your bathroom. You may want to use a non-slip bath mat and install a grab rail in your bath. A bath board/seat in the bath or shower, or even using a plastic garden chair can help. You might want to install a raised toilet seat and grab rail beside the toilet. When you’re lifting things, try to reduce the weight of the item and spread the load across more than one joint. For example, lift with two hands instead of one. If you can’t reduce the weight of an item, slide it rather than picking it up; for example, slide heavy pans across the worktop. Look for items that have non-slip handles. Plan ahead and pace your day. Don’t do large jobs all at once. Instead split them up and do a little at a time. Build in some time between tasks and activities as well, so you can get some rest. Adapt your car to make driving easier. A padded steering wheel, extra side mirrors and a supportive headrest may all help. If you’re buying a new car, you may wish to consider a model with power-assisted steering, and an automatic rather than a manual car. You may be eligible for some help towards the cost of any aids or adaptations you need in your home. Contact your local council for a free assessment. What type of exercise is best for osteoarthritis? What type of exercise is best for osteoarthritis? When you have osteoarthritis, it can hurt when you move. Many people with osteoarthritis worry that exercising will make the damage to their joints worse. But that’s not the case – keeping active can help with your pain and movement in your joints, as well as improve your overall health. It can make you feel better about yourself too. You don’t need any special equipment or facilities to exercise. Simple exercises are often the best. There isn’t one single exercise regime recommended for osteoarthritis. But you might find it best to do a low-impact exercise, that doesn’t put too much strain on your joints – such as swimming, cycling or walking. The important thing is to find something that you can stick with and enjoy. Build up the amount of exercise you do gradually. If you see a physiotherapist, they can give you more information about exercising safely and help you to create an individual exercise programme that works for you. See our topic on starting exercise to give you some ideas. I have osteoarthritis in my hands. Will wearing splints help? I have osteoarthritis in my hands. Will wearing splints help? Splints make sure that your wrist and hand are held and supported in the correct position. There are two main types of splint for arthritis of the wrist and hand. Resting splints. These support your hand, wrist and forearm while you’re resting or sleeping. They are usually worn in bed at night, or occasionally during the day when you’re resting. Resting splints are normally custom made to fit you by a physiotherapist, occupational therapist or orthotist (a health professional who makes devices and aids, like splints and braces). Working splints. This type of splint may help you when you’re doing any type of job where you’re using your hands. It can help to support your wrist and make it feel stronger. They’re made of an elastic or light synthetic rubber-type material, which provides you with more flexible support. You can buy these yourself, but it’s best to get advice from a health professional about the type you need. There are a number of different types of working splints, for example those that specifically support your thumb or wrist. If you wish to wear a splint while driving, contact your insurance company first to check whether your cover will be affected. It’s important that you don’t wear your splint all the time; don't wear it overnight unless your therapist specifically advises you to do this. Check your skin regularly to make sure the splint hasn’t made it red or sore. And do some gentle hand and wrist exercises after removing the splint to stop your joints stiffening up. Hip replacement surgery is a procedure to replace your hip joint with artificial parts (prosthesis) if it’s been damaged or worn away.